The snake above is not the exact snake mentioned. A house in Barombi Kang had a second python snake visitor recently. After the neighbourhood men beat and killed it, they made pepper soup and shared among those who wanted to eat it. The house is tiled so everyone is still surprised as to how this snake crawled in there. A python, estimated to be 8 metres long, was discovered in the bedroom of a man in Barombi Kang, a neigbourhood in the outskirts of Kumba III Municipality towards Buea Road, Kumba on January 6. The Post gathered that the man had returned from work and decided to sleep for a while. He soon heard a strange noise under his bed and when he looked, he discovered that it was a snake. The man reportedly shouted and neighbours came running into the room and killed the python. However, disagreement erupted between the python killers as to whether it should be thrown away or eaten. After heated debates between the inhabitants of the neighbourhoods, the snake was prepared as pepper soap and shared among those who opted to eat. Despite the killing of the snake, many still remain in disbelief as to how the snake could have made its way into the room, given that the floor of the bedroom is tiled. 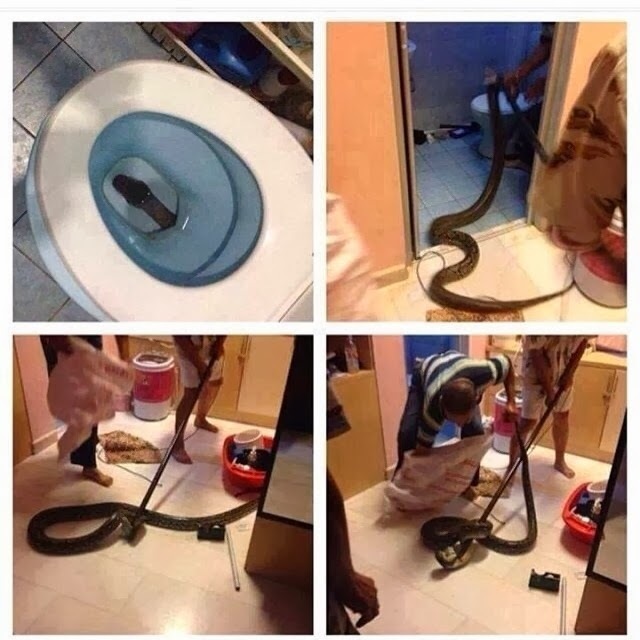 The Post learnt that it is the second time that a snake is visiting the same house. ← Believers drink Virgin cow urine to cure cancer, blindness. Would you drink it.